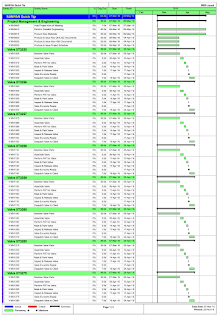 Someone recently asked me if there was a fast way for him to create similar activities in different P6 WBS elements i.e. 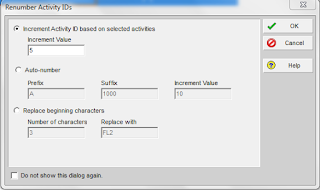 replicate a set of activities across different WBS with copy and paste without having to use Fill Down facility to change the WBS they belong to? This quick tip is the solution I proffered. 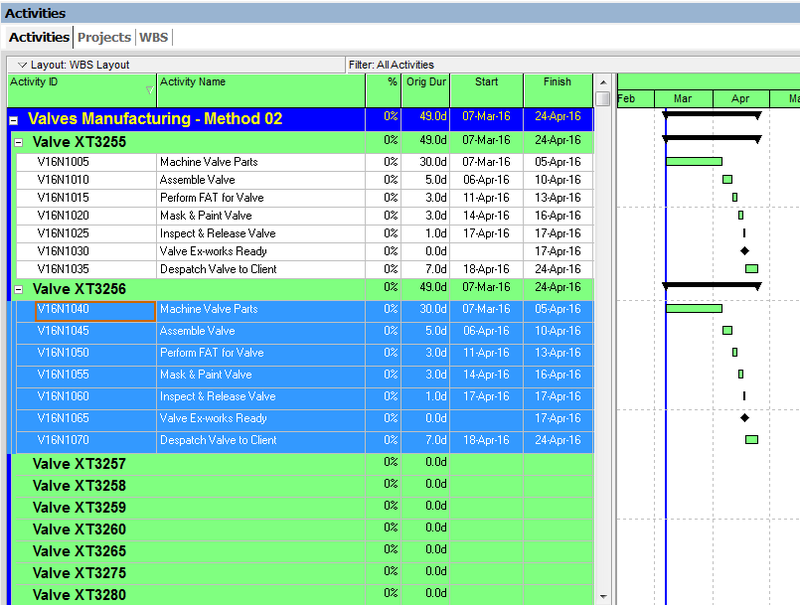 Assuming I want to build a schedule for 13 Valves Assembly with each valve having its own WBS consisting of similar activities, there are 2 methods I usually use. 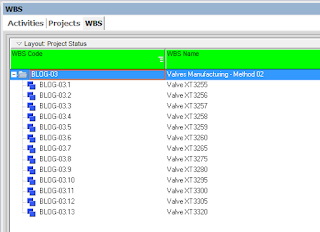 Create the WBS element for the first Valve in the WBS view as shown below. 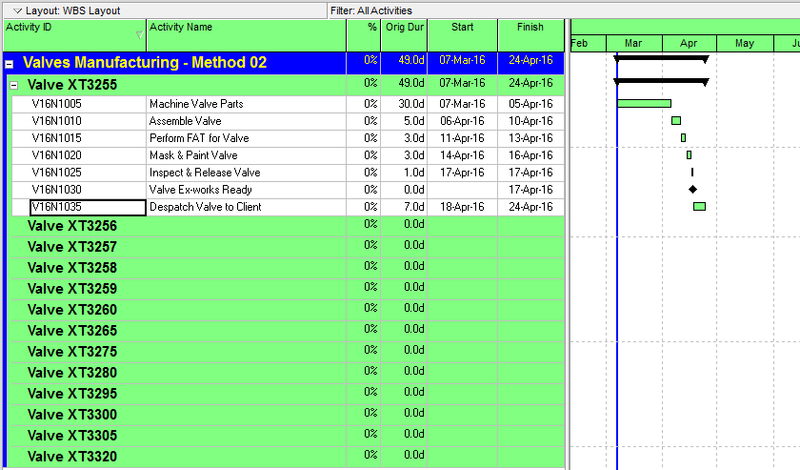 In the Activities view, create and link the set of activities required for Valve XT3255, run a Time Analysis (F9) and our schedule using a layout grouped by WBS should look like the figure below. Now to create similar set of linked activities for the remaining 12 Valves, we need to go back to the WBS view, copy the previously created WBS for Valve XT3255 and paste it. 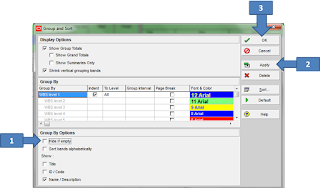 This will open the Copy WBS Options dialog. 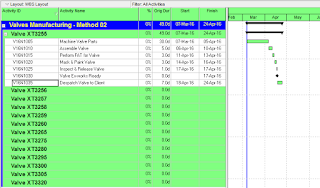 Ensure that the Activities checkbox is ticked and then click OK. 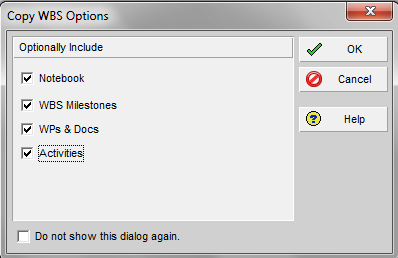 In the Copy Activity Options dialog, ensure that the Relationships and Only between copied activities checkboxes are ticked and then click OK. 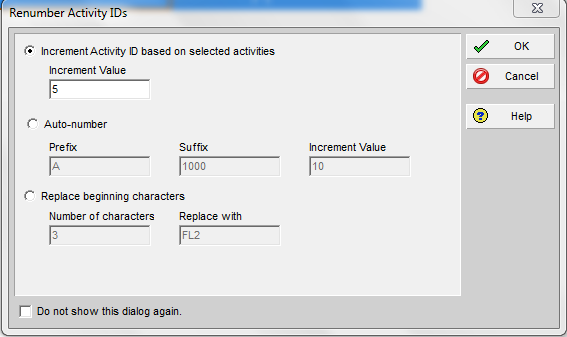 In the Renumber Activity IDs dialog, select one of the 3 option buttons and make changes (in line with your Activity ID coding convention, if you have one) and then click OK. 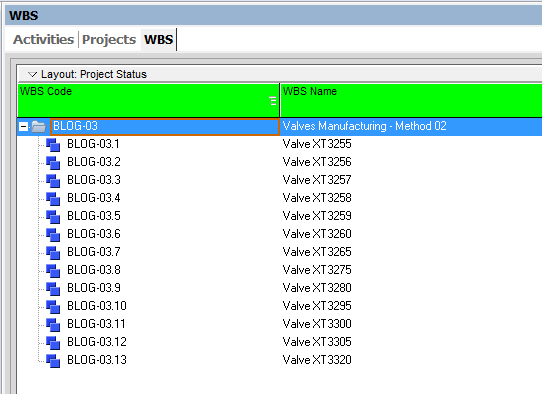 In the WBS view, outdent (using move left) the newly pasted WBS element to same outline level as the first WBS element and then rename the WBS element. 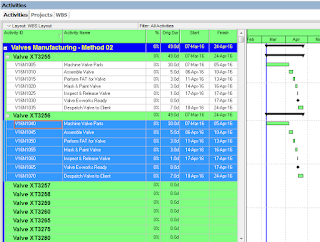 Now if you go to the Activities view, our schedule of similar activities is now ready for other schedule creation tasks such as resource assignment, adding links to other WBS activities etc. 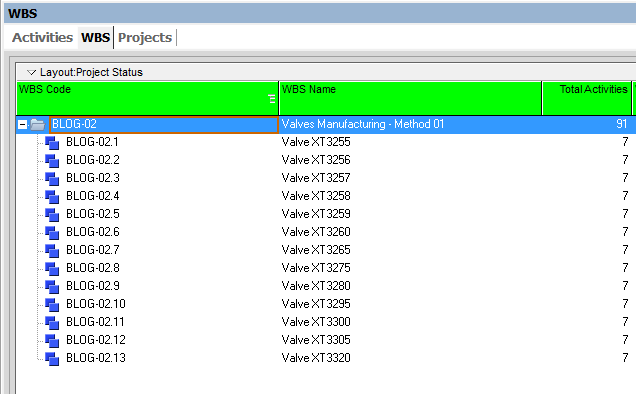 Create all 13 WBS elements for all 13 Valves as shown below in the WBS view. 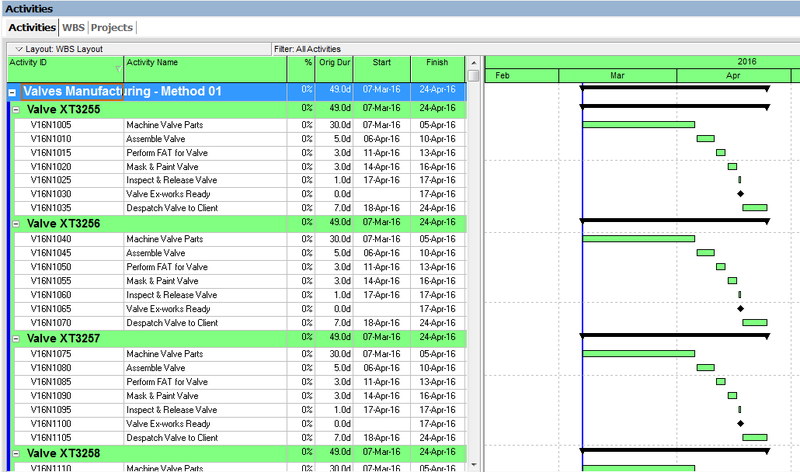 To quickly create same set of activities for the remaining 12 Valves, click on View >> Group and Sort by and in the Group and Sort dialog, untick the Hide if empty checkbox under the Group By Options and then click Apply & OK.
We should now have all the other 12 WBS elements displayed in our layout but with no activities. 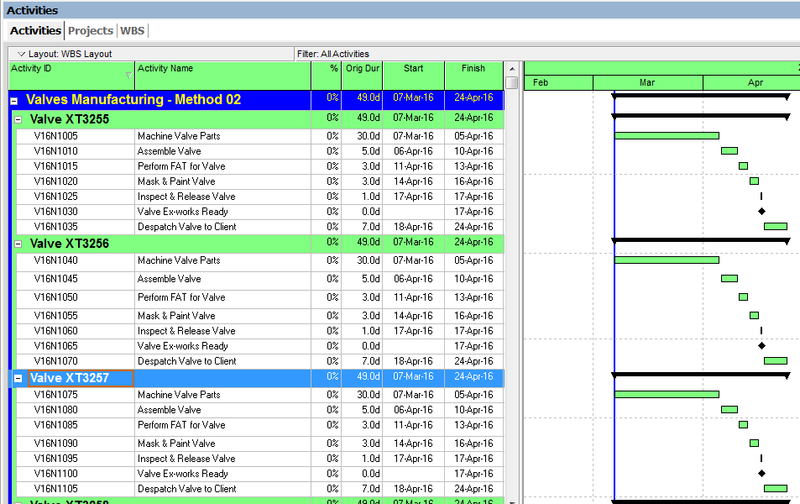 Select and copy all the activities in the first WBS, then select the second WBS and paste the activities. 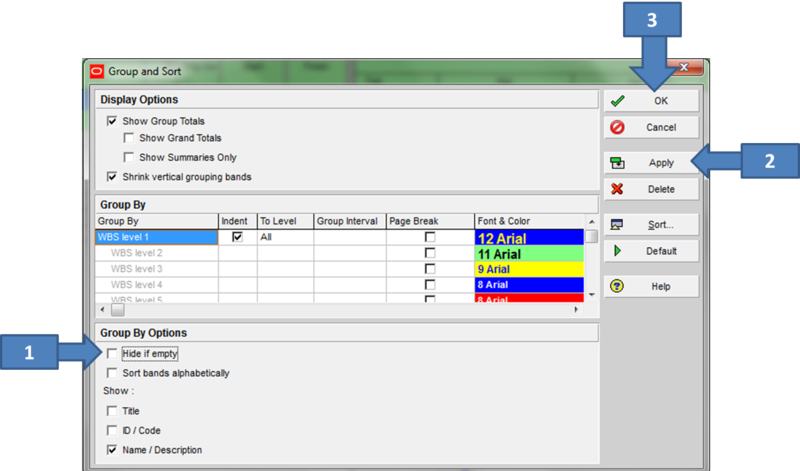 This will open the Copy Activity Options dialog. 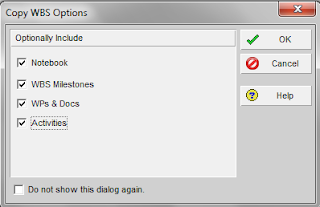 In the Renumber Activity IDs dialog, select one of the 3 option buttons and make changes (in line with your Activity ID coding convention, if you have one) and then click OK. Figure below shows similar set of activities created for the second WBS elemet. 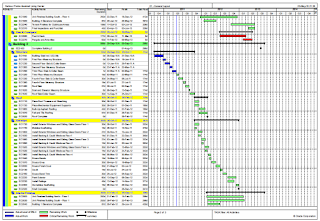 Repeat the copy and paste steps above to create the activities for the remaining 11 WBS elements as shown in the figure below. 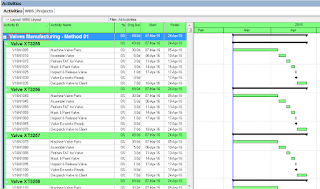 Our schedule of similar activities is now ready for other schedule creation tasks such as resource assignment, adding links to other WBS activities etc.